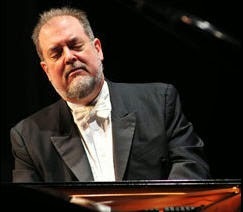 Known for his triumph at the 1970 Chopin International Piano Competition, pianist Garrick Ohlsson brought a satisfying closure to Portland Piano International’s 2013-2014 season with a brilliantly imaginative recital at the Newmark Theater in downtown Portland last Sunday (May 4). In an array of enrapturing colors and languidly dark moods, Ohlsson presented works by Charles Griffes, Alexander Scriabin, and Frédéric Chopin. Just as Griffes drew inspiration from paintings and poetry alike, Ohlsson’s renditions of the opening pieces, The Lake at the Evening and Night Winds from Three Tone Pictures were effectively stimulating visually and audibly. In The Lake at the Evening, a hushed palette of tone loomed throughout the hall, capturing the misty depth one feels when reading The Lake Isle of Innisfree, a poem written by William Butler Yeats, after which it was conceived. In Night Winds, which refers to Edgar Allen Poe’s The Lake, Ohlsson projected a similar aura while intertwining threads of a more sinister darkness. In Roman Sketches, he visited a more sentimental side of Griffes as the instrument exploded with vivid bursts of watery colors in The Fountain of the Acqua Paola, and portrayed sensual expressiveness through Scriabin-esque harmonic blends in The White Peacock. His Scherzo, although brilliantly executed with total technical abandon, lacked a certain lighthearted, dance-like element that is so often the core of a “scherzo” work. Ohlsson returned to the stage with Scriabin’s Third Sonata and further extended an immaculate discernment for dark, inky tones, sustained and dense, which carried the entire audience into a trance-like state. One of the most prominent aspects of Ohlsson’s performance of the Third Sonata was his ability to almost tangibly stretch the texture of the sound in a way that was romantic and alluring, yet not excessively so. Enthusiastic applause following intermission welcomed Garrick Ohlsson back on stage, and instead of taking a seat at the piano, he bowed graciously and remained standing. He then proceeded to explain that this particular recital would have been his first performance of Scriabin’s Seventh Sonata, but, as he stated straightforwardly, “...it did not get ready in time,” and the Fifth Sonata took its place. Ohlsson’s execution of Scriabin’s Fifth Sonata was a whirlwind or obscurity and drastic character shifts, mastering a total control of depth and balance in sound. A daunting frenzy of punctual, percussive elements alternate with seductively melodious and lyrical, clear lines. The last work on the program, Chopin’s Piano Sonata No. 3, emitted a lighter energy in slight contrast with the relatively moody Griffes and Scriabin. What seems to be the true essence of Garrick Ohlsson’s artistry was most prominent in his performance of the Chopin Sonata: a total honesty. This honesty is what makes an Ohlsson an indestructible artist in the sense that illusions and impressions in his playing are non-existent and therefore cannot be torn down. Even when it comes down to admirably refusing to perform a piece when the honest and completely reasonable sentiment is that “...life is what happens when you have other plans,” Ohlsson leaves no room for obscurity in his brilliance. Ruta Kuzmickas is a 18 year old pianist and studies with Dr. Jean-David Coen. Ruta has appeared as a soloist on NPR's From the Top and is a recipient of the Jack Kent Cooke Young Artist Award. She was featured by the Aspen Music Festival in a performance at Harris Concert Hall in 2013 alongside distinguished pianist Ann Schein. Ruta is also a two-time winner of MetroArt's Young Artists Debut: The Van Buren Concerto Concert and was named a 2014 Winner by the YoungArts Foundation.